The Atari ST is a line of home computers from Atari Corporation and the successor to the Atari 8-bit family. The initial ST model, the 520ST, saw limited release in April–June 1985 and was widely available in July. 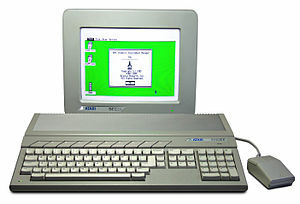 The Atari ST is the first personal computer to come with a bitmapped color GUI, using a version of Digital Research's GEM released in February 1985. The 1040ST, released in 1986, is the first personal computer to ship with a megabyte of RAM in the base configuration and also the first with a cost-per-kilobyte of less than US$1. The Atari ST is part of a mid-1980s generation of home computers that have 16 or 32-bit processors, 256 KB or more of RAM, and mouse-controlled graphical user interfaces. This generation includes the Macintosh, Commodore Amiga, Apple IIGS, and, in certain markets, the Acorn Archimedes. "ST" officially stands for "Sixteen/Thirty-two", which refers to the Motorola 68000's 16-bit external bus and 32-bit internals. The ST was sold with either Atari's color monitor or the less expensive monochrome monitor. The system's two color graphics modes are only available on the former while the highest-resolution mode needs the monochrome monitor. In some markets, particularly Germany, the machine gained a strong foothold as a small business machine for CAD and desktop publishing work. Thanks to its built-in MIDI ports, the ST enjoyed success for running music-sequencer software and as a controller of musical instruments among amateurs and well-known musicians alike. The ST was superseded by the Atari STE, Atari TT, Atari MEGA STE, and Falcon computers. The Atari ST was born from the rivalry between home-computer makers Atari, Inc. and Commodore International. Jay Miner, one of the original designers for the custom chips found in the Atari 2600 and Atari 8-bit family, tried to convince Atari management to create a new chipset for a video game console and computer. When his idea was rejected, Miner left Atari to form a small think tank called Hi-Toro in 1982 and began designing the new "Lorraine" chipset. The company, which was later renamed Amiga Corporation, was pretending to sell video game controllers to deceive competition while it developed a Lorraine-based computer. Amiga ran out of capital to complete Lorraine's development, and Atari, owned by Warner Communications, paid Amiga to continue development work. In return Atari received exclusive use of the Lorraine design for one year as a video game console. After one year Atari would have the right to add a keyboard and market the complete computer, designated the 1850XLD. As Atari was heavily involved with Disney at the time, it was later code-named "Mickey", and the 256K memory expansion board was codenamed "Minnie". After leaving Commodore International in January 1984, Jack Tramiel formed Tramel Technology with his sons and other ex-Commodore employees and, in April, began planning a new computer. The company initially considered the National Semiconductor NS320xx microprocessor but was disappointed with its performance. This started the move to the 68000. The lead designer of the Atari ST was ex-Commodore employee Shiraz Shivji, who had previously worked on the Commodore 64's development. Atari in mid-1984 was losing about a million dollars per day. Interested in Atari's overseas manufacturing and worldwide distribution network for his new computer, Tramiel negotiated with Warner in May and June 1984. He secured funding and bought Atari's Consumer Division (which included the console and home computer departments) in July. As executives and engineers left Commodore to join Tramiel's new Atari Corporation, Commodore responded by filing lawsuits against four former engineers for theft of trade secrets. The Tramiels did not purchase the employee contracts when they bought the assets of Atari Inc., so one of their first acts was to interview Atari Inc. employees to decide whom to hire at what was essentially a brand new company. This company was originally called TTL (Tramiel Technologies Limited), later renamed to Atari Corp. At the time of the purchase of Atari Inc's assets, there were roughly 900 employees remaining from a high point of 10,000. After the interviews, approximately 100 employees were hired to work at Atari Corp.
At one point a custom sound processor called AMY was a planned component for the new ST computer design, but the chip needed more time to complete, so AMY was dropped in favor of an off-the-shelf Yamaha sound chip. It was during this time in late July/early August that Leonard Tramiel discovered the original Amiga contract, which required Amiga Corporation to deliver the Lorraine chipset to Atari on June 30, 1984. Amiga Corp. had sought more monetary support from investors in spring 1984 (among them Tramel Technology, which wished to replace nearly everyone at Amiga). Having heard rumors that Tramiel was negotiating to buy Atari, Amiga Corp. entered into discussions with Commodore. The discussions led to Commodore wanting to purchase Amiga Corporation outright, which Commodore believed would cancel any outstanding contracts, including Atari's. Instead of Amiga Corp. delivering Lorraine to Atari, Commodore delivered a check of $500,000 to Atari on Amiga's behalf, in effect returning the funds Atari invested into Amiga for the chipset. Tramiel countersued Amiga Corp. on August 13, 1984. He sought damages and an injunction to bar Amiga (and effectively Commodore) from producing anything with its technology. At Commodore, the Amiga team was in limbo during the summer of 1984 because of the lawsuit. No word on the status of the chipset, the Lorraine computer, or the team's fate was known. In the fall of 1984, Commodore informed the team that the Lorraine project was active again, the chipset was to be improved, the operating system (OS) developed, and the hardware design completed. While Commodore announced the Amiga 1000 with the Lorraine chipset in July 1985, the delay gave Atari, with its many former Commodore engineers, time to deliver the first Atari ST units in June 1985. In March 1987, the two companies settled the dispute out of court in a closed decision. With the hardware design nearing completion, the Atari team started looking at solutions for the operating system. Soon after the Atari buyout, Microsoft approached Tramiel with the suggestion that they port Windows to the platform, but the delivery date was out by two years, far too long for their needs. Another possibility was Digital Research, who was working on a new GUI-based system then known as Crystal, soon to become GEM. Another option was to write a new operating system in-house, but this was rejected as Atari management was unsure whether the company had the required expertise to do so. Digital Research was fully committed to the Intel platform, so a team from Atari was sent to the Digital Research headquarters to work with the "Monterey Team" which comprised a mixture of Atari and Digital Research engineers. Atari's Leonard Tramiel was the Atari person overseeing "Project Jason" (a.k.a. The Operating System) for the Atari ST line of computers. The name came from the original designer and developer, Jason Loveman. GEM was based on CP/M-68K, essentially a direct port of CP/M to the 68000. By 1985, CP/M was becoming increasingly outdated; it did not support sub-directories, for example. Digital Research was also in the process of building a new DOS-like operating system specifically for GEM, GEMDOS, and there was some discussion of whether or not a port of GEMDOS could be completed in time for product delivery in June. The decision was eventually taken to port it, resulting in a GEMDOS file system which became part of Atari TOS (The Operating System and colloquially known as the Tramiel Operating System). This gave the ST a fast, hierarchical file system, essential for hard drives, plus programmers had function calls similar to IBM PC DOS. The character set is based on codepage 437. Besides the original TOS operating system, a number of third-party OSes were developed for, or ported to, the Atari ST. Among Unix clones, Idris, Minix had an Atari ST port and the Mint OS was developed specifically for the Atari ST.
After six months of intensive effort following Tramiel's takeover, Atari announced the 520ST at the Winter Consumer Electronics Show in Las Vegas in January 1985. InfoWorld described prototypes shown at computer shows as a "typical Commodore-64-style, corner-cutting, low-cost Jack Tramiel product", but Atari unexpectedly displayed the ST at Atlanta COMDEX in May. Due to its similarities to the original Apple Macintosh and Tramiel's role in its development, it was quickly nicknamed the Jackintosh. Atari's rapid development of the ST amazed many, but others were more skeptical, citing the ST's "cheap" appearance, Atari's uncertain financial health, and the poor relations the Tramiel-led Commodore had with software developers. As early as 1981, Adam Osborne wrote that while Tramiel "deserves credit for what he has been able to accomplish", "the microcomputer industry abounds with horror stories describing the way Commodore treats its dealers and its customers." In 1984 Ahoy! had written that Tramiel "had never been able to establish very good relations with computer dealers ... Under his reign, computer retailers have accused Commodore of treating them as harshly as if they were suppliers or competitors". After purchasing Atari, Computer Gaming World stated that his poor reputation likely made computer stores reluctant to deal with the company, hurting its distribution of the ST. One retailer said, "If you can believe Lucy when she holds the football for Charlie Brown, you can believe Jack Tramiel", and another said that because of its experience with Tramiel "Our interest in Atari is zero, zilch". Neither Atari nor Commodore was able to persuade large chains like ComputerLand or BusinessLand to sell their products, but observers criticized Atari's erratic discussion of its stated plans for the new computer, quickly shifting from using mass merchandisers to specialty computer stores to both; Atari executives could not name any computer stores that would carry the ST when asked at COMDEX. One analyst stated after attending a meeting with the company, "We've seen marketing strategies changed before our eyes". Although the more than 30 companies exhibiting ST software at Las Vegas COMDEX in November 1985—while the Amiga had almost none—surprised the industry, Tramiel's poor reputation also influenced potential developers of software for his computer. One stated that "Dealing with Commodore was like dealing with Attila the Hun. I don't know if Tramiel will be following his old habits ... I don't see a lot of people rushing to get software on the machine." Large business-software companies like Lotus, Ashton-Tate, and Microsoft did not promise software for either the ST or Amiga, and the majority of software companies were hesitant to support another platform beyond the IBM PC, Apple, and Commodore 64; "These days, if I were a consumer, I'd stick to companies [Apple and IBM] I know will be around", said Philippe Kahn of Borland. The New York Times reported after Atlanta COMDEX that "more than 100 software titles will be available for the [ST], most written by small software houses that desperately need work", and contrasted the "small, little-known companies" at Las Vegas with the larger ones like Electronic Arts and Activision which planned Amiga programs. Trip Hawkins of Electronic Arts said "I don't think Atari understands the software business. I'm still skeptical about its resources and its credibility." Although Michael Berlyn of Infocom promised that his company would quickly publish all of its games for the new computer, he doubted that many others would soon do so. Other companies such as Spinnaker Software and Lifetree Software were more positive. Both promised to soon release ST software, with the former reporting that "Atari has a vastly improved attitude toward software developers. They are eager to give us technical support and machines", and the latter stating "we are giving Atari high priority". Some, such as Software Publishing Corporation, were unsure of whether to develop for the ST or the Amiga, while John C. Dvorak wrote that the public saw both Commodore and Atari as selling "cheap disposable" game machines, in part because of their computers' sophisticated graphics. Atari ST print advertisements stated "America, We Built It For You", and quoted Atari president Sam Tramiel: "We promised. We delivered. With pride, determination, and good old ATARI know how". Although Atari was out of cash, sales of its 8-bit computers were "very, very slow" according to Jack Tramiel, and employees feared that he would shut the company down, the 520ST shipped during spring 1985 to the press, developers, and user groups, and in early July 1985 for general retail sales, saving the company. By November the company stated that it had sold more than 50 thousand 520STs, "with U.S. sales alone well into five figures". The machine had gone from concept to store shelves in a little under a year. Atari had intended to release versions with 128 KB and 256 KB of RAM as the 130ST and 260ST respectively. However, the ST initially shipped with TOS on disk, requiring 206 KB RAM when loaded, leaving no or little room for applications. The 260ST did make its way into Europe on a limited basis. Early models were designed with six ROM sockets allow easy upgrading to the future ROM-based TOS. These became available only a few months later and were included in all new machines as well as being available as an upgrade for older machines. By late 1985 the machines were also upgraded with the addition of an RF modulator (for TV display), a version known as the 520STM. ST systems before the Mega ST range have no battery-backed clock. Atari originally intended to include GEM's GDOS (Graphical Device Operating System), which allowed programs to send GEM VDI (Virtual Device Interface) commands to drivers loaded by GDOS. This allowed developers to send VDI instructions to other devices simply by pointing to it. However, GDOS was not ready at the time the ST started shipping and was included in software packages and later ST machines. Later versions of GDOS supported vector fonts. A limited set of GEM fonts were included in the ROMs, including the standard 8x8 pixel graphical character set for the ST. It contained four unusual characters which can be placed together in a square, forming a facsimile of the face of J. R. "Bob" Dobbs (the figurehead of the Church of the SubGenius). The ST was less expensive than most machines, including the Macintosh Plus, and tended to be faster than most. Largely as a result of the price/performance factor, the ST would go on to be a fairly popular machine, notably in European markets where the foreign-exchange rates amplified prices. Indeed, the company's English advertising strapline of the era was "power without the price." In fact, an Atari ST and terminal emulation software was much cheaper than a Digital VT220 terminal, which was commonly needed by offices with central computers. The original 520ST case design was created by Ira Velinsky – Atari's chief Industrial Designer. The ST is wedge-shaped, featuring bold angular lines and a series of grilles cut into the rear for airflow. The keyboard has soft tactile feedback and rhomboid-shaped function keys across the top. The 520ST is an all-in-one unit, similar to earlier home computers like the Commodore 64, but with a larger keyboard with cursor keys and a numeric keypad. The 520ST uses an external power brick. The 520ST features a large number of ports mounted at the rear of the machine that remained largely unchanged over the ST's history. Because of its bi-directional design, the Centronics printer port can be used for joystick input, and several games make use of available adaptors that plugged into the printer socket, providing two additional 9-pin joystick ports. The ST supports a monochrome or color monitor. The color hardware supports two different resolutions, 320 × 200 with 16 out of 512 colors, or 640 × 200 with 4 out of 512 colors. The monochrome monitor was less expensive and has a single resolution of 640 × 400 at 71.25 Hz. The attached monitor determines available resolutions, so software either supports both types of monitors or only works with one. Color is required by a majority of games. Atari initially used single-sided disk drives that could store up to 360 kB. Later drives were double-sided and stored 720 kB. Some commercial software, particularly games, shipped by default on single-sided disks, even supplying two 360kB floppies instead of a single double-sided one, for fear of alienating early adopters. Another sticking point with the ST's floppy drives was that, whilst double-sided drive equipped STs could happily read discs formatted under MS-DOS on IBM PCs, PCs could not themselves read Atari disks, because the initial versions of TOS could recognise, read, and write to – but not themselves create – discs in the same particular specification used and indeed demanded by MS-DOS because of different field usage on the FAT filesystem. [clarification needed] Achieving successful data interchange between the two platforms using floppies thus required pre-formatting dedicated file transfer discs under MS-DOS, and copying the necessary data onto them from any unsuitable Atari formatted discs, or by using a conversion utility such as MOSDOS.TOS to adapt an ST disk to make it readable on a PC. This formatting issue was soon resolved by the emergence of third-party formatting and file copier software, MS-DOS disc imaging software capable of reading the unusual formats used by the ST and various other machines (such as the Commodore Amiga) and, a few years later, Atari's own version 1.4 (and later) TOS upgrades. Atari later upgraded the basic design in 1986 with the 1040STF (also written STF). The machine is generally similar to the earlier 520ST, but moved the power supply and a double-sided floppy drive into the rear of the housing of the computer, as opposed to being external. This added to the size of the machine, but reduced cable clutter in the back. The joystick/mouse ports, formerly on the right side of the machine where the disk drive now sat, were moved to a niche underneath the keyboard. The 1040ST was the first personal computer shipped with a base RAM configuration of 1 MB. When the list price was reduced to $999 in the U.S. it appeared on the cover of BYTE in March 1986 as the first computer to break the $1000/megabyte price barrier; Compute! noted that, in fact, the 1040ST was the first computer to break the $2500/megabyte price barrier. However, the ST remained generally the same internally over the majority of its several-year lifespan. The choice of model numbers was inherited from the model numbers of the XE series of the Atari 8-bit family of computers. A limited number of 1040STFs shipped with a single-sided floppy drive. The same basic design was also used for a cut-down version, the 512 kB 520STFM, which replaced the earlier 520ST models in the market. The early 'STF' machines lack the 'M' modulator that allows a TV to be used and will only work with a monitor. Initial sales were strong, especially in Europe where Atari sold 75% of its computers. Germany became Atari's strongest market, with small business users using them for desktop publishing and CAD. To address this growing market segment, Atari came up with the ST1. Debuted at Comdex in 1986, it was received favorably. Renamed the Mega, this new machine includes a high-quality detached keyboard, a stronger case to support the weight of a monitor, and an internal bus expansion connector. A 20 MB hard drive called the SH204 could be purchased as an option and stacked below or above the main case of the Mega. The upcoming SLM804 laser printer would not come with a processor or memory, reducing costs. It would attach to the Mega through the ST DMA port and require the Mega computer to render the pages. As TOS was not a multitasking OS, this meant the computer could not be used while printing. Initially equipped with 2 or 4 MB (a 1 MB version, the Mega 1 would later follow), the Mega machines would complement the Atari laser printer for a low-cost desktop publishing package, which received acclaim and was featured on the cover of Computer Shopper magazine. A custom blitter co-processor was to be included to speed the performance of some graphics operations on the screen, but due to delays it was eventually released on the Mega 2 and Mega 4 machines. Developers wanting to use it had to detect for it in their programs because it was not present on all machines. However, properly written programs using the screen VDI commands can use the blitter seamlessly, since GEM API is a higher-level interface to TOS. In late 1989, Atari released the 520STE and 1040STE (also written STE), enhanced version of the ST with improvements to the multimedia hardware and operating system. It features an increased color palette of 4,096 colors from the ST's 512 (though the maximum displayable palette of these without programming tricks was still limited to 16 in the lowest 320x200 resolution, and even fewer in higher resolutions), Genlock support, and a blitter co-processor (stylized as "BLiTTER") which can quickly move large blocks of data (most particularly, graphics data) around in RAM. The STE was the first Atari with PCM audio; using a new chip, it added the ability to play back 8-bit (signed) samples at 6258 Hz, 12517 Hz, 25033 Hz and even 50066 Hz, via DMA (Direct Memory Addressing). The channels are arranged as either a mono track or a track of LRLRLRLR... bytes. RAM was now much more simply upgradable via SIMMs. Two enhanced joystick ports were added (two normal joysticks can be plugged into each port with an adapter), with the new connectors placed in more easily accessed locations on the side of the case. The enhanced joystick ports were re-used in Atari's Jaguar console and are compatible. The STE models initially had software and hardware conflicts resulting in some applications and video games written for the ST line being unstable or even completely unusable, primarily caused by programming direct hardware calls which bypassed the operating system. Furthermore, even having a joystick plugged in would sometimes cause strange behavior with a few applications (such as the WYSIWYG word-processor application 1st Word Plus). Very little use was made of the extra features of the STE: STE-enhanced and STE-only software was rare. The last STE machine, the Mega STE, is an STE in a grey Atari TT case that had a switchable 16 MHz, dual-bus design (16-bit external, 32-bit internal), optional Motorola 68881 FPU, built-in 3½-inch floppy disk drive, VME expansion slot, a network port (very similar to that used by Apple's LocalTalk) and an optional built-in 3½" hard drive. It also shipped with TOS 2.00 (better support for hard drives, enhanced desktop interface, memory test, 1.44 MB floppy support, bug fixes). It was marketed as more affordable than a TT but more powerful than an ordinary ST. In 1990, Atari released the high-end workstation-oriented Atari TT030, based on a 32 MHz Motorola 68030 processor. The "TT" name ("Thirty-two/Thirty-two") continued the nomenclature system as the 68030 chip had full 32-bit wide buses both internally and externally. Originally planned with a 68020 CPU, the TT included improved graphics and more powerful support chips. The case was a new design with an integrated hard-drive enclosure. The final ST computer is the multimedia-capable Atari Falcon030. Like the TT, this was also 68030-based, operating at 16 MHz, but with improved video modes and an on-board Motorola 56001 audio digital signal processor. The Falcon, like the Atari STE, supports sampling frequencies above 44.1 kHz; the sampling master clock is 98340 Hz, which can be divided by a number between 2 and 16 to get the actual sampling frequencies. Apart from these frequencies, it is also able to play the STE sample frequencies (up to 50066 Hz) in 8 or 16 bit, mono/stereo, all by using the same DMA interface as the STE, with a few additions. The Falcon can both play back and record samples; it has 8 mono channels / 4 stereo channels; thus this allowed musicians to use the computer for harddisk recording. Although the 68030 microprocessor is capable of using 32-bit memory, the Falcon uses a 16-bit bus which affects performance, but also served to reduce its cost. In another cost-reduction measure, Atari shipped the Falcon in an inexpensive case much like that of the STF and STE. Aftermarket upgrade kits were available that allowed the Falcon to be put in a desktop or rack-mount case, with the keyboard separate. Released in 1992, the Falcon was discontinued by Atari the following year. In Europe, C-Lab licensed the Falcon design from Atari, and released the C-Lab Falcon Mk I (the same as Atari's Falcon except for some slight modifications to the audio circuitry), Mk II (as Mk I but with an internal 500 MB SCSI hard disk) and Mk X (as Mk II but in a desktop case). The C-Lab Falcons were also imported to the US by at least some Atari dealers. As with the Atari 8-bit computers, software publishers attributed their reluctance to produce Atari ST products in part to—as Compute! reported in 1988—the belief in the existence of a "higher-than-normal amount of software piracy". That year WordPerfect threatened to discontinue the Atari ST version of its word processor because the company discovered that pirate bulletin board systems (BBSs) were distributing it, causing ST-Log to warn that "we had better put a stop to piracy now ... it can have harmful effects on the longevity and health of your computer". In 1989 magazines published a letter by Gilman Louie, head of Spectrum Holobyte. He stated that he had been warned by competitors that releasing a game like Falcon on the ST would fail because BBSs would widely disseminate it. Within 30 days of releasing the non-copy protected ST version, the game was available on BBSs with maps and code wheels. Because the ST market was smaller than that for the IBM PC it was more vulnerable to piracy which, Louie said, seemed to be better organized and more widely accepted for the ST. He reported that the Amiga version sold in six weeks twice as much as the ST version in nine weeks, and that the Mac and PC versions had four times the sales. Computer Gaming World stated "This is certainly the clearest exposition ... we have seen to date" of why software companies produced less software for the ST than for other computers. The ST has built-in MIDI ports, and there was plenty of MIDI-related software for use professionally in music studios, or by amateur enthusiasts. The popular Windows/Macintosh applications Cubase and Logic Pro originated on the Atari ST (the latter as Notator Logic, preceded by Creator, Notator and Notator-SL). Another popular and powerful ST music sequencer application, Dr. T's KCS, contains a "Multi-Program Environment" that allows ST users to run other applications, such as the synthesizer patch editing software XoR (now known as Unisyn on the Macintosh), from within the sequencer application. Music tracker software was popular on the ST, such as the TCB Tracker, aiding the production of quality music from the Yamaha synthesizer ('chiptunes'). An innovative music composition program that combines the sample playing abilities of a tracker with conventional music notation (which was usually only found in MIDI software) is called Quartet (after its four-note polyphonic tracker, which displays one monophonic stave at a time on color screens). Due to the ST having comparatively large amounts of memory for the time, sound sampling packages became a realistic proposition. The Microdeal Replay Professional product features a sound sampler that cleverly uses the ST cartridge port to read in parallel from the cartridge port from the ADC. For output of digital sound, it uses the on-board frequency output, sets it to 128 kHz (inaudible) and then modulates the amplitude of that. Another program that had success on the ST platform is MasterTracks Pro from Passport Designs, of Half Moon Bay, CA., that was first put out by Don Williams for the Macintosh. When the ST died, a PC version continued that one could port MIDI to using the generic .MID format. GVox bought out Passport, and continues the program for Windows and macOS along with the other Passport product, the notation program Encore. Also popular on the ST was professional desktop publishing software, such as PageStream and Calamus; office tools such as word processors (WordPerfect, Microsoft Write, AtariWorks, WordWriter ST, First Word [shipped with the machine] and its Plus continuation, and others); spreadsheets (3D-Calc, LDW Power, LDW Power 2, LOGiSTiX Senior, PowerLedger ST, SwiftCalc ST, VIP Professional, and others); turnkey programs (Mail-Pro, Sales-Pro 6, Video-Pro, and others); database programs (A-Calc Prime, Data Manager, Data Manager Professional, DBMan V, Base Two, H&DBase, Informer II, DB Master One, SBT Database Accounting Library (dLedger, dInvoice, dOrder, dPurchases, and dPayables), Superbase Personal, Superbase Professional, Tracker ST, Zoomracks and others); and various CAD and CAM tools from amateur hobbyist to professional grade (Campus CAD, DynaCADD, Leonard ST, Technobox CAD/2...): all being largely targeted at, or even limited to owners of high-resolution monochrome monitors. Graphics programs such as NEOchrome, Degas & Degas Elite, Canvas, Deluxe Paint, and Cyber Paint (which author Jim Kent would later evolve into Autodesk Animator) featured advanced features such as 3D design and animation. One paint program, Spectrum 512, uses the ST's rapid palette switching ability to expand the maximum number of colors to be displayed on-screen at once to 512 (up to 46 in each scan line. 3D computer graphics applications (like Cyber Studio CAD-3D, which author Tom Hudson would later develop into Autodesk 3D Studio), brought 3D modelling, sculpting, scripting, and computer animation to the desktop. Video-capture and -editing applications using special video-capture 'dongles' connected using the cartridge port – low frame rate, mainly silent and monochrome, but progressing to sound and basic color (in still frames) by the end of the machine's life. At the end, Spectrum 512 and CAD-3D teamed up to produce realistic 512-color textured 3D renderings, but processing was slow, and Atari's failure to deliver a machine with a math coprocessor had Hudson and Yost looking towards the PC as the future before a finished product could be delivered to the consumer. The Atari ST was the computer upon which today's prevalent graphical touchscreen point of sale software for restaurants was originally developed. This software was created by Gene Mosher under the ViewTouch copyright and trademark. It does not feature the Atari ST's GEM graphical user interface but, instead, features an application specific graphical user interface and widget framework which he developed using, in part, the Neochrome paint program. The initial development kit from Atari included a computer and manuals. The $5,000 cost discouraged many from developing software for the ST. Later, the Atari Developer's Kit consisted of software and manuals (but no hardware) for $300. Included with the kit were a resource kit, C compiler (first Alcyon C, then Mark Williams C), debugger, and 68000 assembler (plus the non-disclosure agreement). The third-party Megamax C development package reduced the cost of entry to $200. The ST came bundled with a system disk that contained ST BASIC, the first BASIC for the ST. However, due to its poor performance, users favored other BASICs, such as HiSoft BASIC, GFA BASIC, FaST BASIC (notable for being one of the few programs to be supplied as a ROM cartridge), DBASIC, and STOS, which then inspired and led to the creation of AMOS on the Amiga, and was powerful enough that it was used (with a compiler, opposed to its usual runtime interpreter) for the production of at least two commercial titles and a host of good quality shareware and public domain games. In the late years of the Atari ST Omikron Basic was bundled with it in Germany. Other development tools include 68000 assemblers (MadMac from Atari Corp, HiSoft Systems's Devpac, TurboAss, GFA-Assembler), Pascal (OSS Personal Pascal, Maxon Pascal, PurePascal), Modula-2, C compilers (Lattice C, Megamax C, GNU C, Aztec C, AHCC), LISP, Prolog, Logo, and others. The ST enjoyed success in gaming due to the low cost, fast performance, and colorful graphics. Notable individuals who developed games on the ST include Peter Molyneux, Doug Bell, Jeff Minter, Éric Chahi, Jez San, and David Braben. The realtime pseudo-3D role-playing video game Dungeon Master, was developed and released first on the ST, and was the best-selling software ever produced for the platform. Simulation games like Falcon and Flight Simulator II made use of the ST's graphics, as did many arcade ports. Proto first person shooter MIDI Maze, uses the MIDI ports to connect up to 16 machines for networked deathmatch play. The critically acclaimed Another World was originally released for ST and Amiga in 1991 with the engine developed on the ST and the rotoscoped animations created on the Amiga. Games simultaneously released on the Amiga that didn't use the Amiga's superior graphics and sound capabilities were often accused by video game magazines of simply being ST ports. Garry Kasparov became the first player to register the commercial ChessBase, a popular commercial database program produced for storing and searching records of games of chess. The first version was built for Atari ST with his collaboration in January 1987. In his autobiography Child of Change, he regards this facility as "the most important development in chess research since printing." Spectre GCR lets the ST emulate the Macintosh. There were also MS-DOS emulators released in the late 1980s. PC-Ditto came in two versions: software-only, and a hardware version that plugs into the cartridge slot or kludges internally. After running the PC-Ditto software, a DOS boot disk is required to load the system. Both allow users to run DOS programs in CGA mode, though much more slowly than on an IBM PC. Other options are the PC-Speed (NEC V30), AT-Speed (Intel 80286) and ATonce-386SX (Intel 80386sx) hardware emulator boards. German electronic music pioneers Tangerine Dream relied heavily on the Atari ST in the studio and for live performances during the late 1980s and 1990s. The album notes for Mike Oldfield's Earth Moving state that it was recorded using an Atari ST and C-Lab MIDI software. The Fatboy Slim album You've Come A Long Way, Baby has an Atari ST in the large foldout picture of Fatboy Slim's studio. Electronic music artists Mike Paradinas and Luke Vibert started out writing music on Atari STs. In the Paris performance of Jean Michel Jarre's album Waiting for Cousteau, musicians have attached Atari ST machines with unidentified MIDI software to their keyboards, as could be seen in the TV live show and video recordings. White Town's "Your Woman", which reached #1 in the UK singles charts, was created using an Atari ST.
Atari Teenage Riot named itself after the brand and programmed most of their music on an Atari ST, including the entire album Is This Hyperreal? (June, 2011). Cabaret Voltaire founder Richard H. Kirk said in 2016 that he continues to write music on an Atari 1040ST with a sequencer called C-Lab. ST Shifter "Video shift register chip" – Enables bitmap graphics using 32 KB of contiguous memory for all resolutions. Screen address has to be a multiple of 256. ST GLU "Generalized Logic Unit" – Control logic for the system used to connect the ST's chips. Not part of the data path, but needed to bridge chips with each other. ST MMU "Memory Management Unit" – Provides signals needed for CPU/blitter/DMA and Shifter to access dynamic RAM. Even memory accesses are given to CPU/blitter/DMA while odd cycles are reserved for DRAM refresh or used by Shifter for displaying contents of the frame buffer. ST DMA "Direct Memory Access" – Used for floppy and hard drive data transfers. Can directly access main memory in the ST.
MC6850P ACIA "Asynchronous Common Interface Adapter" – Enables the ST to directly communicate with MIDI devices and keyboard (two chips used). 31.250 kbit/s for MIDI, 7812.5 bit/s for keyboard. MC68901 MFP "Multi Function Peripheral" – Used for interrupt generation/control, serial and misc. control input signals. Atari TT030 has two MFP chips. WD-1772-PH "Western Digital Floppy Disk Controller" – Floppy controller chip. YM2149F PSG "Programmable Sound Generator" – Provides three—voice sound synthesis, also used for floppy signalling, serial control output and printer parallel port. HD6301V1 "Hitachi keyboard processor" – Used for keyboard scanning and mouse/joystick ports. CPU: Motorola 68000 16-/32-bit CPU @ 8 MHz. 16-bit data/32-bit internal/24-bit address. Drive: Single-sided 3½" floppy disk drive, 360 kB capacity when formatted to standard 9 sector, 80 track layout. Very early machines included the OS on a floppy disk due to it not being ready to be burned to ROM (like the Amiga 1000 had). This early version of TOS was bootstrapped from a very small core boot ROM, but this was quickly replaced with (expanded capacity) ROM versions of TOS 1.0 when it was ready. (This change was also greatly welcomed as older ST machines with memory below 512 kB suffered, as GEM loaded its entire 192 kB code into RAM when booting the desktop). Having the OS loaded from disk was due to Atari trying to rush the machines to market without ironing out all the bugs in the OS. Soon after this change, most production models became STFs, with an integrated single- (520STF/512 kB RAM) or double-sided (1040STF/1024 kB RAM) double density floppy disk drive built-in, but no other changes. The next later models used an upgraded version of TOS: 1.02 (also known as TOS 1.2). Another early addition (after about 6 months) was an RF Modulator that allows the machine to be hooked to a color TV when run in its low or medium resolution (525/625 line 60/50 Hz interlace, even on RGB monitors) modes, greatly enhancing the machine's saleability and perceived value (no need to buy a prohibitively expensive, even if exceptionally crisp and clear, monitor). These models were known as the 520STM (or 520STM). Later F and FM models of the 520 had a built-in double-sided disk drive instead of a single-sided one. Memory: 30-pin SIMM memory slots (SIPP packages in earliest versions) allowing upgrades up to 4 MB Allowable memory sizes including only 0.5, 1.0, 2.0, 2.5 and 4.0 MB due to configuration restraints (however, 2.5 MB is not officially supported and has compatibility problems). Later third-party upgrade kits allow a maximum of 14MB w/Magnum-ST, bypassing the stock MMU with a replacement unit and the additional chips on a separate board fitting over it. Original model with 512 KB RAM, external power supply, no floppy disk drive. The early models had only a bootstrap ROM and TOS had to be loaded from disk. originally intended to be a 256 kB variant, but actually sold in small quantities in Europe with 512 KB. Used after the release of the 520ST+ to differentiate the cheaper 512 KB models from the 1 MB models. Because the early 520ST's were sold with TOS on disk, but this used up 192 KB or RAM so the machine only had around 256KB left. a 520ST with a built-in modulator for TV output and 512 KB RAM. a 520STM with a newly redesigned motherboard in a larger case with a built-in floppy disk drive (in some cases a single sided drive only), and 512 KB RAM. redesigned motherboard with 1, 2 or 4 MB of RAM, respectively, in a much improved "pizza box" case with a detached keyboard. All MEGA mainboards have a PLCC socket for the BLiTTER chip and some early models did not include the BLiTTER chip. They also included a real-time clock and internal expansion connector. Some early MEGA 2 had a MEGA 4 mainboard with half of the memory chip places unpopulated and the MEGA 2 can be upgraded by adding the additional DRAM chips and some resistors for the control lines. The MEGA 1 mainboards had a redesigned memory chip area and could not be upgraded in this way as there are only places for the 1 MByte DRAM chips. a portable (but definitely not laptop) version of the ST with the complete ST keyboard, an LCD screen simulating 640x400 hi-res, and a mini-trakball intended mostly for travellers and musicians because of the backlit screen and its built-in midi ports. Originally designed to operate on 12 standard C cell flashlight batteries for portability, when Atari finally realized how quickly the machine would use up a set of batteries (especially when rechargeable batteries of the time supplied insufficient power compared to the intended alkalines), they simply glued the lid of the battery compartment shut. a later portable ST, more portable than the STacy, but sacrificing several features in order to achieve this – notably the backlight and internal floppy disk drive. Files were meant to be stored on a small amount (one megabyte) of internal flash memory 'on the road' and transferred using serial or parallel links, memory flashcards or external (and externally powered) floppy disk to a desktop ST once back indoors. The screen is highly reflective for the time, but still hard to use indoors or in low light, it is fixed to the 640 × 400 1-bit mono mode, and no external video port was provided. Despite its limitations, it gained some popularity, particularly amongst musicians. The 130ST was intended to be a 128 KB variant. It was announced at the 1985 CES alongside the 520ST but never produced. The 4160STE was a 1040STE, but with 4 MB of RAM. A small quantity of development units were produced, but the system was never officially released. Atari Transputer Workstation is a standalone machine developed in conjunction with Perihelion Hardware, containing modified ST hardware and up to 17 transputers capable of massively parallel operations for tasks such as ray tracing. Following Atari's exit from the computer market, both Medusa Computer Systems and Milan Computer manufactured Atari Falcon/TT-compatible machines that used 68040 and 68060 processors. The FireBee is an Atari ST/TT clone based on the Coldfire processor. The GE-Soft Eagle is a 32 MHz TT clone. PS3000: Combined 12-inch color monitor and 360k 3½-inch floppy drive (SF354). Speaker. Manufactured by JVC in limited quantity (~1000), only a few working models remain. ^ a b c Maremaa, Tom (1985-06-03). "Atari Ships New 520 ST". InfoWorld. p. 23. Retrieved 19 July 2014. ^ "Atari Is Shipping 520 ST Computer". The New York Times. 1985-07-10. ^ A.N.A.L.O.G. TCS #1 001 03/20/85 DRI SHIPS GEM: net.micro.atari: Google Groups. Groups.google.com (1985-03-11). Retrieved on 2013-04-22. ^ Computing History (1989). "Atari 1040STF". Retrieved 14 January 2019. ^ a b Robinson, Philip; Edwards, Jon R. (March 1986). "The Atari 1040ST". BYTE. p. 84. Retrieved 4 July 2014. ^ "The Future of Atari Computing". STart Magazine. December 1989. Retrieved 2006-06-23. ^ "History of Amiga video" on YouTube (2008-02-18). Retrieved on 2013-04-22. ^ "Confidential Atari-Amiga Agreement" and "Afterthoughts: The Atari 1600XL Rumor". Archives.atarimuseum.com. Retrieved on 2013-04-22. ^ a b c d e f g h Daniels, Jeffrey (Summer 1988). "3 Years With the ST". START Magazine. James Capparell. p. 22. Retrieved 2010-05-15. ^ a b c d e Chin, Kathy (1985-01-28). "Atari Announces Six New Computers". InfoWorld. IDG. pp. 15–16. Retrieved 2011-03-19. ^ "Classic Videogame Hardware Genius Guide". Imagine Publishing. p. 230 – via Google Books. ^ Cohen, Roger (1992-03-22). "A $78 Million Year: Steve Ross Defends His Paycheck". The New York Times. ^ "Jay G. Miner". Archived from the original on 18 February 2008. Retrieved 9 September 2016. ^ Oren, Tim (1986). "Professional GEM Column #15". textfiles.com. Antic Publishing. ^ "Winter CES 1985 Report". ^ McCarthy, Michael, ed. (1985-04-15). "GEM on ROM for the Atari ST". InfoWorld. p. 13. Retrieved 4 February 2015. ^ a b c d Sanger, David E. (1985-05-13). "Atari is Facing New Doubts". The New York Times. Retrieved 5 January 2015. ^ a b Chin, Kathy (1985-01-28). "Atari Promises Software For ST". InfoWorld. IDG. p. 17. Retrieved 2011-03-19. ^ Osborne, Adam (1981-04-13). "The Portable Osborne". InfoWorld. pp. 42–43. Retrieved 1 January 2015. ^ Leeman, Sheldon (May 1984). "The Future of Commodore?". Ahoy!. p. 44. Retrieved 27 June 2014. ^ Oxner, Bill (May 1986). "Hobby & Industry News" (PDF). Computer Gaming World. No. 28. p. 4. Retrieved 17 April 2016. ^ Steele, William (1985-07-09). "COMDEX: Nothing New Under the Georgia Sun". PC Magazine. p. 34. Retrieved 28 October 2013. ^ a b c d "This Season's Computer War". The New York Times. 1985-12-16. Retrieved 31 March 2016. ^ Mace, Scott (1985-12-02). "Christmas Contenders". InfoWorld. Retrieved 2011-01-22. ^ Dvorak, John C. (September 1985). "Image". Ahoy!. p. 5. Retrieved 27 June 2014. ^ "America / We Built It For You / The Atari ST (advertisement)". Compute!. October 1985. p. 19. Retrieved 16 October 2013. ^ Powell, Jack (October 1985). "ST Product News: First ST review". ANTIC. 4 (6). p. 26. ^ Harris, Neil (1985-11-11). "Atari Sales Underestimated". InfoWorld (letter). p. 18. Retrieved 8 January 2015. ^ Atari 8BitChip (May 2018). "Little history of Atari ST, with focus on TOS". Retrieved 14 January 2019. ^ a b Edwards, Jon R.; Robinson, Phillip; McLaughlin, Brenda (January 1986). "The Atari ST". BYTE. Vol. 11 no. 1. p. 84. Retrieved 17 April 2016. ^ "Bold plans for new Atari". InfoWorld. December 1984. Retrieved 2011-08-01. ^ "Atari ST Interfaces & Connectors". info-coach.fr. Retrieved 14 August 2018. ^ Halfhill, Tom R. (April 1986). "A Turning Point For Atari?". Compute!. p. 30. Retrieved 8 November 2013. ^ Williams, Gregg (September–October 1986). "Atari Playfield" (PDF). Computer Gaming World. No. 31. p. 35. Retrieved April 17, 2016. ^ a b Leyenberger, Arthur (June 1988). "ST User". ST-Log. p. 97. Retrieved 11 November 2013. ^ Levitan, Arlan (September 1988). "Levitations". Compute!. p. 86. Retrieved 10 November 2013. ^ Levitan, Arlan (December 1988). "Levitations". Compute!. p. 104. Retrieved 10 November 2013. ^ Louie, Gilman (April 1989). "Low Shelf "ST"eem" (PDF). Computer Gaming World. No. 58. p. 4. Retrieved 17 April 2016. ^ Louie, Gilman (June 1989). "Stop Stealing". Compute!. p. 14. Retrieved 11 November 2013. ^ Dr T'S Kcs And Tiger Cub. Tamw.atari-users.net. Retrieved on 2013-04-22. ^ a b c The Antic Cyber Graphics Software and the Pre-History of Autodesk 3D Studio and Discreet 3ds max. Asterius.com. Retrieved on 2013-04-22. ^ "Dinner with Tom Hudson". Archived from the original on 2007-11-12. Retrieved 2013-04-22. CS1 maint: BOT: original-url status unknown (link). rand.com (17 January 2007). ^ The People of ANALOG. Analog.klanky.com. Retrieved on 2013-04-22. ^ Bisson, Giselle. Getting Down To Business. START Vol. 2 No. 6, Special issue #3. Atarimagazines.com. Retrieved on 2013-04-22. ^ Mard Naman. "Making Tracks With MIDI - A Profile of Tangerine Dream". Retrieved 22 April 2016. ^ White Town – Your Questions Answered!. Whitetown.co.uk. Retrieved on 2013-04-22. ^ "Utah Saints Interview". MusicTech. Archived from the original on 2015-09-16. Retrieved 8 September 2015. ^ "Interview: Richard H Kirk - M Magazine". 21 December 2016. ^ "r/Music - I am Darude. AMA!". reddit. ^ VICE (26 December 2017). "The Story of 'Sandstorm' by Darude" – via YouTube. Wikimedia Commons has media related to Atari ST.